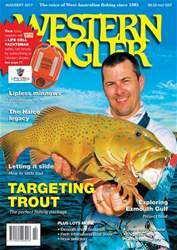 The August-September 2017 edition of WA's only fishing magazine, Western Angler, is out now and it’s the definitive source of WA fishing information. It's once again packed with great articles on fishing in Western Australia. With a Smash Crab eating coral trout on the cover, there's a look at the best ways to target this popular species by Ben Knaggs. Chris Dixon has a very informative article on how to get started with slide baiting, a tricky technique for shore anglers which is slowly becoming more popular. Jamie Chester looks at the legacy Halco Tackle has left in WA fishing and Paul Cunningham delves into a little known style of lure, the lipless minnow. There’s also a look at small boat fishing in the Exmouth Gulf. For junior anglers, Curtis Waterman looks at shore options around Exmouth, and there’s a preview of the Perth International Boat Show. Thrown in articles on hook selection, fishing footwear, cobia and charter options, plus much more, and there is plenty of great reading in the new Western Angler. Plus you could win a Life Cell Yachtsman simply by subscribing to Western Angler.